Born in London in March 1920, Norman Burns was a drummer closely associated with the pianist George Shearing, working with him on the West End night club circuit in the mid 1940s, before Shearing made his fame and fortune in the USA. 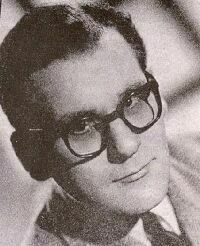 Burns was never a bop musician, although he did record with the Alan Dean Beboppers and others in 1948. He was a regular figure on the modern jazz scene and from March 1951, led a quintet whose format and repertoire were based on the successful George Shearing Quintet formula. They did their first public gig at Feldman's Club early in April 1951 and were an instant hit with the jazz public. Listening to the music now it is difficult to understand why. Although beautifully played the music was formulaic and without much improvisation, but for two and a half years the quintet toured the UK jazz venues with great success. The rigid format of the group was its undoing and although instrumental changes were made and vocalists added, (Eileen Draper and Johnny Green), in 1954 the group disbanded in 1955. Esquire decided to record the quintet in 1952 by which time a number of personnel changes had taken place. Victor Feldman, the highest profile jazz musician to work with the group had left before the records were made, which meant that there were no top jazz musicians remaining in the group. Burns died in Australia, where he had lived for many years, in June 1994. Knock Yourself Out*/Nearing Shearing*/Stars Fell On Alabama*. Johnnie Ashcombe (vib), Basil Tait (p), Len Williams (g), Bert Daniels (b), Norman Burns (d). 1066*/I May Be Wrong/Lily Of The Leguna/Dance Little Lady*/Star Eyes. Eric Greengrass (vib), Basil Tait (p), Len Williams (g), Charlie Short (b), Norman Burns (d). Brahms Lullaby/Bye Bye Blackbird*/It Could Happen To You/I'll See You In My Dreams. John Scott (vib), Harry Smith (p), Len Williams (g), George Davis (b), Norman Burns (d). I'll Get By/Let Yourself Go/Black Magic/Ooh. With the popularity of the 'Shearing type' quintet waning a trumpet and accordian were added to the line up and all former band members replaced. Over the last few months of the band there were frequent personnel changes. John Harris (tp), Gordon Langford (vib), Dave Davani (accor), Les Allen (p), Barry Fox (g), Brian Short (b), Norman Burns (d). Jeepers Creepers/Happy Lobster/I Get A Kick Out Of You/Three O'clock In The Morning. Ian Cameron (tp), Les Brown (vib), Dave Davani (accor), Gordon Langford (p), Ken Wade (g), Dan Haggerty (b), Norman Burns (d). If You Were The Only Girl/How About You/This Can't Be Love/Bill's Blues. Ian Cameron (tp), Martin Slavin (vib), Dave Davani (accor), John Smith (p), Judd Foster (g), Peter Hugget (b), Norman Burns (d). Davani's Design/Wooftide/Yesterdays/Without A Shout. After disbanding Norman Burns freelanced for a while before emigrating to Australia, apparently quitting the music business altogether. However, a recent (2012) email from Austin Powell reports that a 1962 record released by Pye Australia featuring Wayne Cordell lists a Norman Burns as producer. This page was last updated during November, 2012.